W&T Offshore, Inc. WTI announced the pricing of senior second lien notes, with aggregate principal amount of $625 million, at par. The notes will likely carry an annualized interest rate of 9.75% and are expected to mature on Nov 1, 2023. The notes offering to select investors will likely close on Oct 18, 2018. Net proceeds from the offering along with cash balances and borrowings under revolving credit facility (with proposed amendments) are expected to be utilized by W&T Offshore for paying off its outstanding 1.5 Lien Term Loan – with 11.00% interest rate – and Second Lien Term Loan – with 9.00% interest rate. W&T Offshore will also allocate the offering proceeds for fully repurchasing its outstandingSenior Unsecured Notes – carrying 8.500% interest rate with the expected maturity date of 2019 –, Second Lien PIK Toggle Notes – with 9.00% interest rate and maturity date of 2020 –, and Third Lien PIK Toggle Notes – with maturity date of 2021 and carrying interest rate of 8.50%. In connection with the proposed amended credit facility, three commercial banks have offered a commitment letter to W&T Offshore for a revolving bank credit facility. The initial borrowing base will likely be $250 million. Overall, the company’s initiatives of offering notes to repay or repurchase other notes indicate a weak balance sheet. In fact, the company’s shareholder capital is negative, reflecting higher total liabilities than total assets. 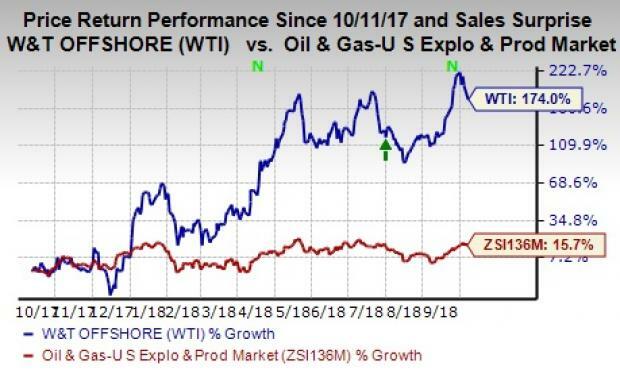 However, W&T Offshore — a leading oil and natural gas exploration and production player — has rallied 174% in the past year, outperforming the 15.7% collective gain of the stocks belonging to the industry. Currently, the stock carries a Zacks Rank #3 (Hold). Meanwhile, a few better-ranked players in the energy sector are Shell Midstream Partners LP SHLX, Petroleo Brasileiro S.A. or Petrobras PBR and Chevron Corporation CVX, each flaunting a Zacks Rank #1 (Strong Buy). You can see the complete list of today’s Zacks #1 Rank stocks here. Shell Midstream Partners has an average positive earnings surprise of 7.9% for the last four quarters. Chevron will likely post earnings growth of 122.9% and 19.4%, through 2018 and 2019, respectively.